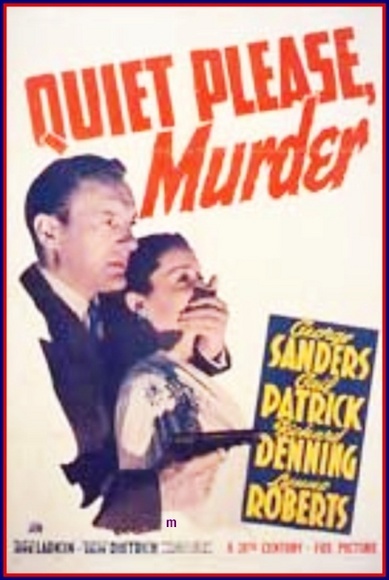 QUIET PLEASE, MURDER! is a really nice, modest little wartime noir written and directed by a fellow who doesn’t seem to have gotten the breaks he deserved, John Larkin. The line he was born to say! Although, in fairness, George makes nearly every line sound like he was born to say it. He says this one to his equally devious and neurotic partner, the silky Gail Patrick, whose job is to certify the fake books as genuine and help their sale. But she goes against his explicit instructions and sells a bogus folio to Sidney “Satan is his father!” Blackmer, whom I will always associate with the role of Roman Castavet in ROSEMARY’S BABY. Blackmer is buying treasures for the Nazis to fund their inevitable post-defeat retirement, and resolves to punish Fleg when he realises he’s been had. Enter the hero, Richard Jennings. I came to have a pretty complicated relationship with this fellow. He enters the story as a private eye, but soon makes a shady deal with Patrick, and I had him pegged as a villain. Once I realised he was meant to be the hero, I liked him a lot less. The actor didn’t seem appealing enough, and there was little reason to like the character. But then I warmed to the chap. True, his hair, seemingly close-cropped, exploded in flailing fronds like some hideous scalp-squid when he got punched. But the character is written with a nice semi-redemption, and is so resourceful I couldn’t withhold respect. Plus Jennings has interesting qualities. His voice has a nice, unusual timbre, like Kirk Douglas when he’s occasionally miscast as an intellectual. Most of the movie takes place in a library during a blackout, and the locked-in quality gives it a slight air of DIE HARD, only less frenetic (That first DIE HARD — that’s quite some movie! Try it if you don’t believe me). It’s nice that we have about five separate factions in the movie, all out to double-cross each other, and all behaving with as much intelligence as the plot will allow. The rogue’s gallery is a delight, and the MALTESE FALCON-y ambivalent hero is enjoyably rendered. Joseph MacDonald shoots it in lustrous monochrome. A good evening in! I got a tape of it from Napier University library, and recommended it to the librarians there. Librarians are underrepresented in cinema, having had to make do with Rachel Weisz in THE MUMMY remake and sequels*, where she doesn’t actually get to grips with the Decimal Dewey system nearly enough. Whereas the plot of this one actually turns upon the act of filing. *Jacques Rivette, however, has given due respect to the book people.